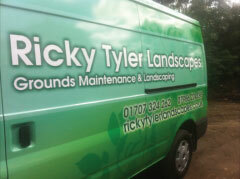 Add style and security to any property or grounds with the professional fencing contractors at Ricky Tyler Landscapes. Our practical, safe and attractive fences and gates are suitable for any outdoor need - from protecting playgrounds to securing industrial compounds. A strong and sturdy fence will add value and protection to any premises, can help to lower insurance premiums, keeps staff and visitors safe from hazards, and maintains restricted access when required. Fences and gates are also ideal for animal control, navigation and management of open spaces, and the protection of commercial or industrial premises and sites. We source our fencing from leading suppliers and also provide a bespoke fencing option, so no matter what you're looking to contain or surround, we've got the answer. 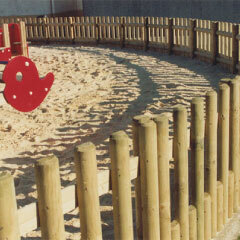 All fencing is supplied direct to you and installed by experienced, qualified landscaping and gardening specialists. Whether you're looking for something in particular or you need our designers to help you, you'll love the result we deliver. All fences can be finished to your liking, from varnished hardwoods to galvanised and powder coated steel. Gates can be made to measure as well, enabling you to create easy access points while maintaining the perimeter's security. Looking for safety fencing? Our fence specialists can help you to risk assess your commercial premises and determine the best options for your needs, before supplying and fitting barriers wherever required. Your new fences and gates will be covered by a comprehensive warranty for your peace of mind, and we guarantee to beat any genuine quote so you can be sure of a fantastic deal. Had a fence damaged by vandals or by bad weather? Call Ricky Tyler Landscapes and we'll carry out maintenance, replace damaged panels, and undertake any other fencing work you require. Ricky Tyler Landscapes can provide gardening and grounds maintenance services including Fencing covering London, Essex, Hertfordshire, Northampton, Buckinginghamshire & Bedfordshire .